All personnel receive advanced training in medical care, fire suppression, and special operations. The District accumulated over 25,626 hours of fire, special operations, and EMS related training in 2017. 1) Determine the readiness of new driver/operators. 2) Ensure department personnel are trained in pump and apparatus operations. The program was a success; all firefighters passed the testing. Live Fire Training: The Live Fire Training Center at Station Four is an important tool when training on interior and exterior fire operations. Personnel from various fire departments throughout Lee and Collier Counties participate in our live fire training burns. 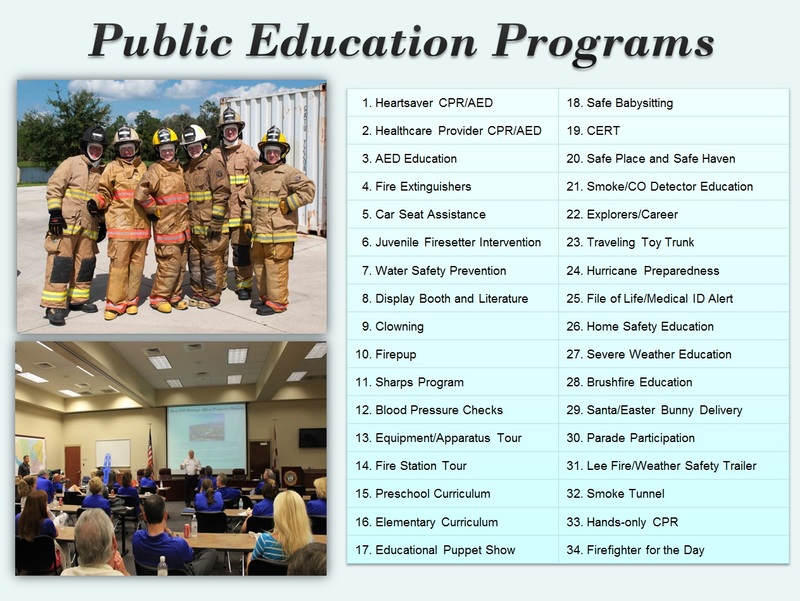 This totals to over 350 firefighters trained in Bonita Springs’ Live Fire Training Center in 2017. Other programs to maintain competency in their field, such as the Health Stream Interactive Web Based Training System, are utilized. Emergency Medical Providers receive their renewal certificates and licenses from the State. My name is Dr. Alexander Rodi, Jr., and I am the Medical Director for the Bonita Springs Fire District. My duties include training and credentialing your emergency medical technicians (EMTs) and paramedics, reviewing quality of care your EMTs and paramedics deliver, and establishing and maintaining acceptable practice guidelines which we have developed in conjunction with Lee County Emergency Medical Service. Our EMTs and paramedics come from the same training programs as the County’s EMTs and paramedics. The difference, and greatest benefit to you, is that our EMTs and paramedics are also firefighters; they have dual certifications in both firefighting and medical care. In addition, your paramedics have multiple certifications in trauma care, pediatric care, basic life support, advanced life support, and I provide monthly lectures on various medical issues related to patient care and treatment. Our EMTs and paramedics are professionals, always striving to be the best in the county. Trained to think outside the box, they use their training and knowledge to deliver the best care possible to the citizens of Bonita Springs. Since we respond to a large number of medical calls, it is important to understand that time is critical. From initiating a 9-1-1 call for chest pain, to arrival to the hospital, any unnecessary delay can mean the difference between life and death. Your Fire District strives to provide the very best pre-hospital medical care economically possible. We continue to work toward providing ambulance service on a local level to improve the current level of service and your quality of life.